Brent's fingerless mitts are done, too. The pattern was in the Winter 2013 issue of Knit Simple; it was easy and pretty quick....and hopefully, useful. 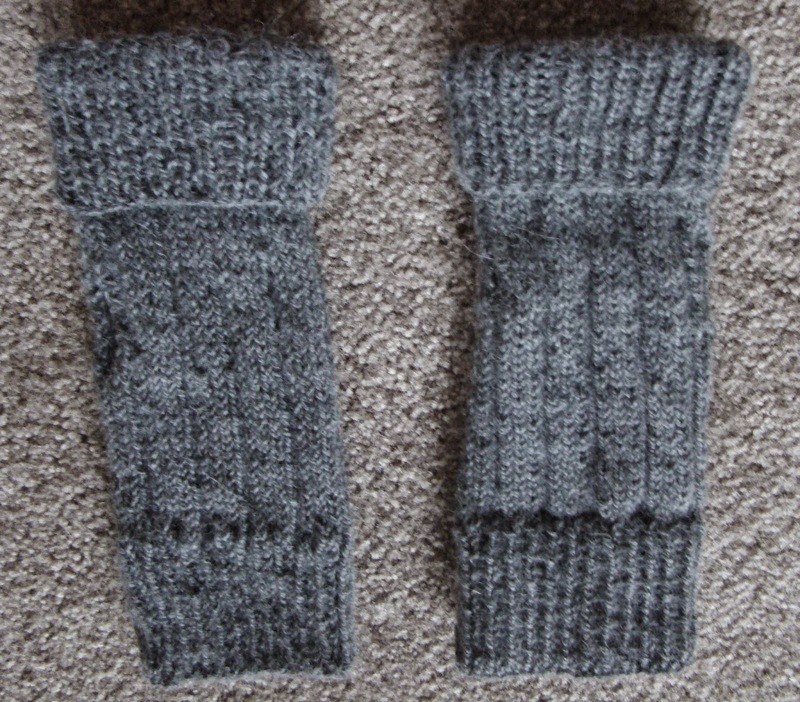 This is the first pair of mitts that I've made with an opening for the thumb instead of a thumb gusset. To make the opening the pattern said to knit back and forth rather than in the round and then reconnect after about 10 rows. Interestingly enough, it worked! And then, just this afternoon I learned that there will be a birthday girl at the celebration. Yikes, what to do? Luckily I have yarn left from this project. She has long hair and is a skier, so maybe she will like a headband? I'm about 3 inches into it, and Sunday's a long way off, right? Wish me luck. Happy knitting everyone! For inspiration, go to Patchwork Times and see what everyone else has On Their Needles. Excellent knit gifts. They will be used and loved. Great gifts! We all need warm items right now. The sweater is adorable. Enjoy the birthday celebrations. Fabulous gifts! They will all certainly be appreciated. All very appropriate knitted gifts for anytime, but especially now. Thanks for shsring. Good job on your knitting projects...especially like the hooded sweater. The cardigan is adorable and perfect for your climate (and mine)! The construction of the thumb opening on the mitts is really interesting. How lucky that you knit so well and these people all receive such thoughtful gifts. That sweater looks toasty warm. Love love love the sweater. !! Judy its wonderful. I love the fingerless and I have to try the thumbhole method on my current pair. I think the headband is darling and any recipient would love it!! Wonderful kitting projects. Hope you made your knitting goal on the headband! Love your header photo. Yours? That hooded sweater is sooooo cute!! All your projects are very nice; you've been clicking those needles at a pretty rapid pace! 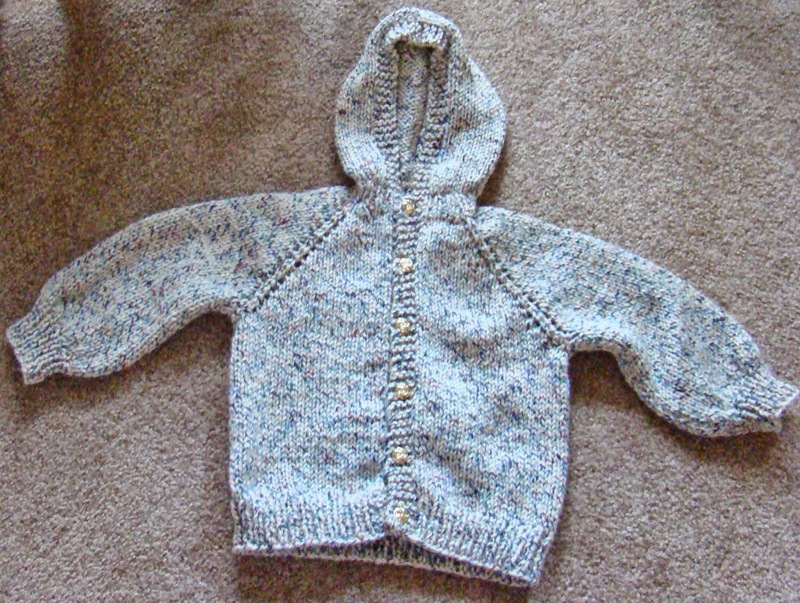 beautiful sweater :) Hooded ones are the best, then every part is toasty warm. The mitts are nice as well, my son would love those! Nice projects, Judy. The tweedy yarn looks really cozy. Nice mitts too. Nice! I'm sure Brent is enjoying his fingerless mitts as much as I am enjoying mine! I want to put them in a blog post soon. I love them. One Declared Done and Two Finishes! January Birthdays, a Grand Celebration!